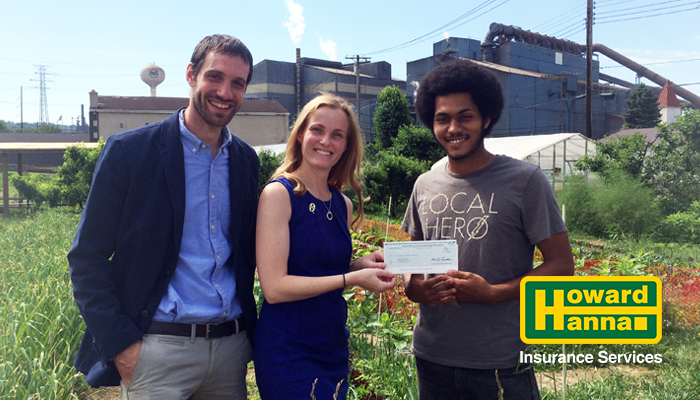 Pittsburgh, PA (July 25, 2017) — Grow Pittsburgh received a grant from Westfield Insurance Foundation thanks to the help of Howard Hanna Insurance Services. The grant is part of the Westfield Legacy of Caring program, which invites Westfield independent insurance agencies to nominate a local nonprofit in the areas of disaster recovery, insurance pathways, family stability or safety. “Howard Hanna Insurance Services and its employees are proud members of the Pittsburgh area community. Our collaboration with Westfield Insurance allows us to further our citizenship efforts and have impact in critically important initiatives,” said Annie Hanna Engel, Esquire, and president, Howard Hanna Insurance Services. Thanks to the generous donation from Westfield Insurance Foundation, Grow Pittsburgh can increase their efforts toward establishing workforce development programs in Braddock to combat the cycle of generational poverty and lack of opportunity in that community. “Each year Braddock Farms serves an estimated 350 Braddock residents through the weekly farm stands and the Urban Farm Apprenticeship and Urban Farmers in Training programs. In addition to weekly farm stand and training programs, Braddock Farms also hosts tours, volunteer groups, and events that focus on education and community engagement,” said Christina Bard, Grow Pittsburgh Development Manager. “The Urban Farm Apprenticeship is seen as a stepping stone from the Urban Farmers in Training and is geared towards individuals with barriers to employment. Since its inception, over 35 young adults have graduated from the program,” added Bard. Grow Pittsburgh is one of 78 nonprofits nationwide receiving a Westfield Legacy of Caring grant – collectively totaling nearly $550,000. Westfield is proud to work with their independent agents in distributing nearly $1.3 million since the onset of the Legacy of Caring program in 2015. Grow Pittsburgh works with the Braddock Youth Project to employ teens for the Urban Farmers in Training Program. Each summer six teens are hired at Braddock Farms for eight weeks of hands-on training, gaining experience on all aspects of farm work. For many this is their first job and it helps support their family. Students participate in the weekly farm stand engaging with their neighbors. The main goals of the program are to teach the teens to grow food, develop cooking skills, learn about their place in the food system, and build leadership and public speaking skills. Grow Pittsburgh also hires up to 8 seasonal apprentices who work on Braddock Farms, Shiloh Farm, and the Frick Greenhouse, learning about seasonal growing. The Urban Farm Apprenticeship trains young adults from the areas of Braddock and Homewood, aged 18 to 25, in all aspects of urban agriculture and food production. They also engage in weekly field trips to local farms, restaurants, and community organizations to better understand the food industry, environment, and social justice with the goal of gaining food-related entrepreneurship skills. The program runs from March through November, approximately 10 hours per week to allow participants to be employed or enrolled in school elsewhere. Westfield Insurance is a part of Westfield Group, a customer-focused insurance and banking group of businesses headquartered in Westfield Center, Ohio, and in business for nearly 170 years. Westfield Insurance provides commercial insurance in 21 states, personal insurance in 10 states and surety services to customers in 50 states. Westfield is one of the nation’s 50 largest property and casualty insurance groups, represented by a network of more than 1,000 independent insurance agencies. Learn more about Westfield Group at www.WestfieldInsurance.com and www.Westfield-Bank.com. How AWESOME is this! Reaching out to Grow Natural Home Grown food! You know they talk about EMP’s (Electromagnetic Pulses and other varients in the world) that could effect our production and services Nationally. But IT does NOT effect those, who learn how to cultivate to help others. This is a GREAT way to show local farmers (up and coming sprouts too) that YES, they are indeed needed for the continuation of our local, state and Nation’s best asset, to be able to feed the people, which IS a VERY VERY important entity. With this seed of growth (literally) in funding… I can’t wait for the evolution of growth to really start climbing in Braddock! Love it 🙂 Love it 🙂 Love it :). I used to walk on the train tracks in Braddock when I was in college with some musical mates (ahem Stormin Norman Nardini) and truly good place to be, as well as many movies that were and continue to be filmed there :). Congrats to the Howard Hanna Insurance Department! Applause Applause Applause! 🙂 You Rock!